Lock in a great price for Tapa Kawi Villas – rated 8.9 by recent guests! Big room, very clean, nice view from bathroom directly to the pool, delicious nasi goreng and pizza, humble staff. I got shower and bathtub even though i just request shower only.. I liked being in nature away from the busy centre of ubud. Truly relaxing for the soul. Everything was awsome. Go there and you will feel the real balinese culture. P.S - the private pool villa makes every penny. Friendly staffs, quiet place and very good breakfast. It's heaven. Loved everything. Food, facilities, staff, pool, nature. Gorgeous pool with amazing views. Staff were super helpful and friendly too. Very big room with all comfort and the private pool are great. Breakfast and dinner also very good. Good place for all who'd like to have a quite place inside the lodge with actually only 4 Room sich. The views were spectacular, from the moment we arrived it took our breath away. loved the free shuttle service, it made getting into Ubud a lot easier. The staff were very friendly and accommodating, always polite and respectful. The Experience breakfast was my favourite by far! and my partner loved the Nasi goreng and Mi goreng breakfasts, It was great to try traditional Indonesian food. If we headed out for the evening the staff made sure our room was ready when we arrived back by putting on the aircon and setting up the mosquito net, it made us feel very well looked after. It was lovely and quiet, no road noises, only magical forrest sounds, which is hard to find in Bali. Because its up a bit higher the weather was a bit cooler and slightly less humid which was lovely. Perfect place, perfect location, We loved it! Tapa Kawi Villas This rating is a reflection of how the property compares to the industry standard when it comes to price, facilities and services available. It's based on a self-evaluation by the property. Use this rating to help choose your stay! Located in Ubud, Tapa Kawi Villas offers a year-round outdoor pool and a spa center. Guests can enjoy a meal at the restaurant, as well as afternoon tea with Balinese sweets. 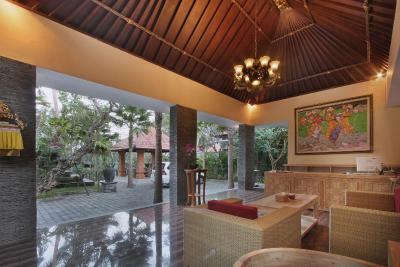 The property offers secured parking and free shuttle service to the center of Ubud. Each room is fitted with a flat-screen TV. Certain units include a seating area to relax in after a busy day. A terrace or balcony are featured in certain rooms. Every room is equipped with a private bathroom equipped with a bath. Extras include bath robes, slippers and free toiletries. Tapa Kawi Villas features free WiFi . Guests can enjoy morning trekking through the rice fields and various Balinese activities. Elephant Cave is a 15-minute drive from Tapa Kawi Villas, while Ubud Palace and Monkey Forest are a 30-minute drive away from the property. The nearest airport is Bali Denpasar International Airport, 1.5-hours drive from the property. This property is also rated for the best value in Tegalalang! Guests are getting more for their money when compared to other properties in this city. When would you like to stay at Tapa Kawi Villas? This villa features a private pool, a dining area and a balcony with views of the river. It's fitted with a flat-screen TV, a personal safe and a mini-bar. The private bathroom comes with a bathtub, robes, slippers and free toiletries. This villa features a terrace overlooking the valley and tropical rain forest. It's fitted with a flat-screen TV, air conditioning and mini-bar. The private bathroom comes with a bathtub, robes, slippers and free toiletries. perched on a valley cliff near the relief heritage Gunung Kawi, Tapa Kawi Villas is managed by Pramana Experience under Tapa Hotels, the Pramana brand for small boutique hotels and villas. Located only 5 minutes drive from Tirta Empul, the holy spring temple at Tampak Siring and 25 minutes drive to Ubud Center, Tapa Kawi Villas feature four of one bed room infinity pool villas and six Valley view deluxe. Situated on a high land surrounded with spring river has rich of healing vibe. Tapa Kawi villas is a spritual sanctuary to escape and get healed. House Rules Tapa Kawi Villas takes special requests – add in the next step! One child under 12 years is charged IDR 300000 per night when using existing beds. Tapa Kawi Villas accepts these cards and reserves the right to temporarily hold an amount prior to arrival. Please note that restaurant and half part of the hotel building are under renovation and some noise might be expected during the day until further notice. Breakfast will serve by room service as the restaurant will not operate during the renovation. The renovation work is currently ongoing in the hotel. As a result most of the hotel property is closed and you just have the room to yourself. However because of the construction you will keep hearing irritating sounds and it made my stay at the resort a waste of my time and money. My advise would be not to stay here. The room looked totally different from the pictures we saw on Booking; the furniture was old, ugly and broken; the bathroom was very dirty and the wc stinked awful! The sheets, although changed daily, had stains and were smelly; the towels were ripped and looked dirty. Overall, the entire rooms was dirty and had staines everywere. The staff recommended drivers to takes us to different places to visit, apparantly cheaper than the prices we would pay if we booked a tour with the hotel, but in reality the drivers tried to get as much money as possible from us, citing that there was miscommunication regarding the distance of the place we wanted to visit or to get to. We had arguments with them everytime we wanted to go somewere! The beakfast was not that good. The meal was delicious, so weight increased. We found a rat running in our room one night. And then I found another rat in the drawer. That really scared me a big time. The private pool is not really private. The staffs walk by very so often. Big room. Nice room service. We thought that it's a place out in the nature, however there is a busy street just in front of the hotel. Nevertheless you are relatively far away from Ubud. Walking through rice fields from the hotel is a challenge as you have to find the access after walking riskyly along the road. Our relaxing holiday became a nightmare. There was construction happening during daylight hours which alone isn't a problem the limited peace and quiet we could get was interrupted by multiple phone calls to our room from staff asking what our plans for the day were (when we had already told them the day before that we had no plans but to relax). On our second day in the early afternoon we receive a call about staff visiting the hot water cylinder in our room to fix another rooms hot water which was the last time we had warm water for the duration of our stay. Our romantic meal was moved inside because of rain (not an issue) but it was set up using the couch and coffee table and was awkward and uncomfortable. I have dietary requirements which I had told them about when we ordered our meal the day before (onion intolerance) and I had checked with the lady who bought us our food and she had assured me the kitchen knew. Before the second course was over I had terrible stomach cramping from onions with bloating, gas and diarrhea to follow throughout the evening. We had booked in for a couples massage but when they turned up they had no plans or preparation for where they would massage us and suggested the bed and couch DEFINITELY NOT. They should of bought massage tables with them or had a room set up for us considering this was offered by tapa kawi. My partner came up with the idea of using the mattresses on the floor from the loungers outside and he bought them in for us. This was all included in our hour massage when it should not have been. The professionals said we were only to wear underwear but did not offer a towel or blanket l to cover ourselves (or leave the room so we could live down in private but instead stood there in front of us waiting for us to undress. Once the massage got underway it was too vigorous and felt rushed, not relaxing at all. After calling at 8. The fact that it takes them quite a lot to reply to messages + even when they replied they provided information that were misleading. I know that tourism in Bali had decrease in numbers of arrivals because of the volcano but giving information that are not truthful is not the way to run business. This property is not suitable for anybody who has a difficulty walking as steps are too high and surfaces are slippery and uneven. The location is great, secluded and romantic. Everything was just wonderful. The food is amazing especially afternoon tea. The staff are always smiling and helpful. I would thoroughly recommend the cooking class too. Loved it all.